Ribs—those saucy, tasty staples of every barbecue joint—take centre stage in this celebratory cookbook. 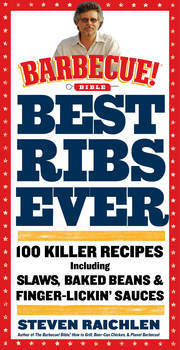 Author Steven Raichlen, America’s master griller, leaves no stone unturned in this 100-recipe rib extravaganza. The book offers a complete crash course on the art of grilling and smoking ribs, including how to recognize the different cuts (and what to look for when buying them). Raichlen shows us eight essential prepping and cooking techniques and six great ways to cook ribs over a live fire. He provides a guide to grills and smokers and tells how to grill indoors and outfit yourself with the right tools and accessories. Raichlen gives us ribs—ribs in every iteration imaginable: First-Timer’s Ribs. Grilled Lamb Ribs with Garlic and Mint. Even Cousin Dave’s Chocolate Chipotle Ribs. Raichlen gives us side dishes: Smoke-Roasted Sweet Potatoes and Molasses Mustard Baked Beans. He gives us sauces: Lemon Brown Sugar Barbecue Sauce and Ginger, Rum, and Pineapple Barbecue Sauce. He gives us drinks and desserts: Guadeloupean Rum Punch and a Grilled Peach Caramel Sundae. And now, he gives us a brand-new chapter of grilling menus, complete with all-new recipes. The definitive guide to the lip-smackingest ribs, from America’s master griller—now with a new cover, new title, and a completely new menu chapter with new recipes.